Islamabad, 19 September 2017 – Internet services have been suspended in the Federally Administered Tribal Areas (FATA) of Pakistan since 12 June 2016 following a dispute at the Torkham border between Afghan and Pakistani forces. 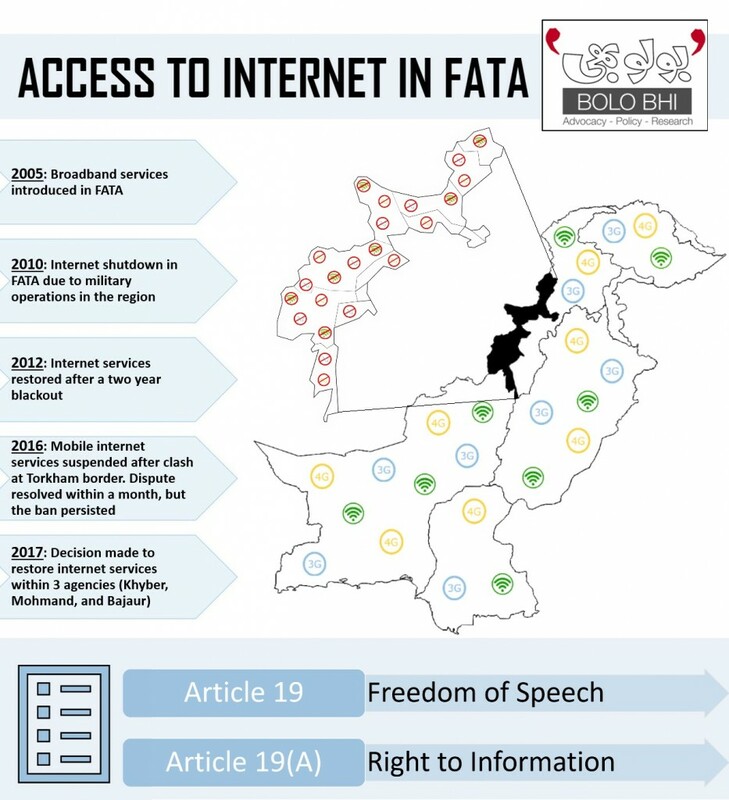 Over a year later, the internet ban is still in effect, disrupting communications throughout the area which affects over 5 million citizens within the seven agencies of FATA. According to Bolo Bhi’s independent findings online, North and South Waziristan Agencies currently lack broadband connectivity, while Khyber, Bajaur, and Kurram Agencies have broadband connections limited to larger towns. The bigger problem is that mobile internet services are unavailable to users in FATA. Mobile internet connectivity holds major potential for access to information for citizens. With an estimated 67% mobile phone connection penetration in Pakistan, the number of mobile internet users is expected to grow exponentially from the current level of 43 million users today, according to Pakistan Telecommunication Authority (PTA) figures. Since the introduction of broadband services in FATA in 2005, the government has regularly restricted access to the internet or blocked it altogether. In 2010, an internet ban in the region lasted two years before being lifted. Security is often the reason cited for taking these measures, but the threat is rarely defined clearly. The authorities have not cited any evidence of how the ban of internet improves security. These bans are in violation of Article 19-A of the Constitution of Pakistan which guarantees the right to information as a fundamental right. Furthermore, the pretext of security is used to silence the public criticising the government. These bans infringe upon the right to free speech and obstruct the dissemination of information – especially from journalists. Curbing internet access in FATA so severely is also a dangerous precedent that could be used to impose similar restrictions across the country. It goes without saying that in the 21st century the internet is essential for political, social, and economic interaction as well as the sharing of information. The internet shutdown has gravely hindered these aspects of quotidian life, from communication between family members across the globe to the circulation of news. The utility of access to internet in furthering civil and political rights of citizens of FATA is evident from how mainstream media started covering the protest in Parachinar after a tragic bomb attack in June 2017 after reports of the protest started trending on social media. The ban is indicative of a larger oversight in regards to the government and the public’s treatment of FATA. The region is mostly excluded from socio-economic discourse which in turn impedes upon any policy recommendations and implementation. Apart from the constitutional marginalisation of the region, this exclusion further stems from the absence of data in national surveys undertaken by authorities such as the Pakistan Bureau of Statistics (PBS), as well as under representation in social policy forums such as the National Economic Council (NEC), Council of Common Interest (CCI), and National Finance Commission (NFC) Awards. FATA has lied outside the jurisdiction of courts of law, and the Constitution restricts FATA from Acts of Parliament unless they are specifically extended to FATA by the President of Pakistan. Inhabitants of FATA are thus denied their fundamental human rights, and have no legal or political avenue to challenge their oppression. Deprived of holding the government accountable through political action and representation, residents of FATA rely heavily on the internet and new media to challenge the archaic rules imposed upon them by the archaic and colonial Frontier Crimes Regulation (FCR) and call for constitutional reform. In the past month, the FATA Secretariat has approved the decision to restore mobile and internet connectivity in Khyber, Bajaur, and Mohmand agencies. This is a welcome step, and should be extended to the other four agencies of FATA namely Orakzai, Kurram, North Waziristan, and South Waziristan immediately. 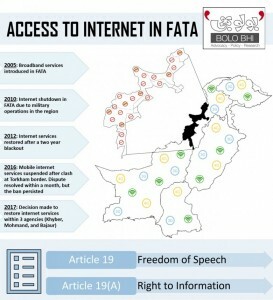 Bolo Bhi strongly advocates the right to freedom of speech through digital mediums, and calls on the Government of Pakistan, and especially the institutions responsible for governance of FATA, to immediately lift the ban on internet in FATA and allow internet access to the citizens as they are constitutionally entitled to, in line with the latest moves to mainstream FATA into Pakistan.